For as long as she can remember Celine Sun has been fascinated with numbers. As a 10 year old girl living in Xuzhou, China she started noticing a list of companies in the newspaper whose printed prices seemed to change everyday. She asked her father, who worked in finance, and he explained they were stocks. The stock exchange had recently been reopened in China, and as Celine learned more about it she became fascinated by the idea that you could pay a particular price one day and the value could increase significantly the next. After perusing the list she identified a company that appeared to be the most affordable, then told her parents she intended to use the “lucky money” she got as a Chinese New Year gift to make the purchase. However, she didn’t realize that there were two stock exchanges in China, and the one she was following in the paper was based on the US dollar, not the Chinese renminbi. Disappointed at the shortcoming, Celine figured she’d have to wait until her next windfall to buy the stock. Not wanting his ambitious daughter to miss the opportunity, Celine’s father fronted her the extra money, and she officially became a shareholder. But Celine wasn’t always laser-focused on finance. In fact, she avoided studying it in college. That seems like a very natural beginning for someone who now leads research efforts for Wealthfront’s financial services products, and has been a key player in developing the PassivePlus® suite of investment features. But Celine wasn’t always laser-focused on finance. In fact, she avoided studying it in college, as she didn’t want to follow in her parents’ footsteps (her dad worked in finance and her mom was an accountant). 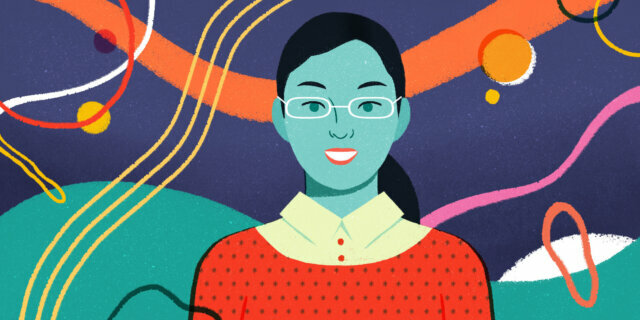 But she had a real knack for numbers and solving complex problems, so she pursued an undergraduate degree in mathematics in her native China before moving on to a PhD program in statistics 7,000 miles away at Syracuse University. Wanting to work on a more “real world” application of statistics, she took a number of genetics and human biology courses at Syracuse where she studied how to measure and analyze strains of DNA and protein chains. But despite her initial resistance to studying finance, she happened upon an elective course in investing. Just as buying that first stock gave her a jolt, the investing course ignited something in her she hadn’t yet felt in her other studies. So after doing some soul searching she made the decision to dramatically shift her academic focus. After researching the best programs in the country, she transferred to a PhD program in finance at the University of Washington, with the goal of becoming a university professor. Seattle proved to be a fortuitous move, both professionally and personally. She met and married her now-husband after being introduced through mutual friends shortly after she settled in. They eventually welcomed their first son, and Celine added full-time mom to her existing role as a full-time doctoral student. But once she came to the end of her studies, she got the “real world” bug once again. Realizing she had basically spent her entire life in school, she wanted to get some professional experience, namely to help make her a more well-rounded instructor. She eventually landed an internship with Parametric, a leading global management asset firm. At Parametric she was inspired by the idea of solving complex problems for investors, but she was most intrigued by one of their signature investment features: Tax-Loss Harvesting. But while the work experience was short lived, the impact was long-lasting. With defending her thesis last on her academic to-do list, Celine moved with her son (and a second on the way) to join her husband in the San Francisco Bay Area, where he had relocated previously for work. Living in the hotbed of data and technology that is Silicon Valley proved to be influential, and Celine was intrigued by big data. After doing some more research on jobs working with large data sets, she put her dissertation on hold and accepted a role as a data scientist at LinkedIn. It was a bit of a detour, but the experience confirmed that she wanted to work outside of academia. However, the subject matter wasn’t holding her interest. Remembering the thrill of picking a stock as a youngster and how much she loved her projects at Parametric, Celine determined that she needed to work in finance. But she was in a quandary; finance was her passion, but she was also turned off by the traditional industry due to the prevalence of hidden fees and lack of transparency. Feeling a bit stuck, she decided to leave LinkedIn and return to her thesis, hopeful she’d eventually figure out how to work in the finance industry and actually feel good about it. As fate would have it, Celine was presenting at the R/Finance Conference, where she earned the “best paper” honor and caught the eye of Wealthfront’s then-head of engineering. He knew the company needed a ringer to help lead research efforts, so he reached out and convinced Celine to come checkout the company. After a few weeks of interviewing, she knew that Wealthfront was the answer she had been looking for: a mission driven company focused on changing the traditional industry for good. Four years later Celine has become one of Wealthfront’s most important assets, helping to architect high-end-but-low-cost investment features, like Smart Beta and Risk Parity, which enables Wealthfront to fulfill its mission to deliver sophisticated financial services to as many people as possible. Knowing that the traditional industry can often “mansplain”, Celine believes that delivering financial advice through software is the best way to level the playing field. When she’s not building the future of investing, she tries her to be the best mom she can be. When asked if she’ll let her sons (now 7 and 6) pick a stock just like she did, she’s quick to say “no” through her signature smile. “I talk with them about diversification, not stock picking.” That might seem pretty young to start planting the seed of passive investing, but to Celine it’s never too early to plan for the long-term, especially for women. A self-proclaimed “superfan” of compounding interest, her message to women is simple: focus on yourself and start planning and investing as early as you can. Knowing that the traditional industry can often “mansplain”, Celine believes that delivering financial advice through software is the best way to level the playing field. As for her future plans, she intends to keep building new solutions at Wealthfront to help everyone become smarter about planning for their futures. It looks like the lifelong student has finally become the teacher. The Women of Wealthfront, or WoW, collaborates with people across the company, male and female, to foster an environment of diversity that elevates our individual and collective potential. We do this by promoting the understanding of diversity and bias, supporting the hiring, retention, and promotion of women, giving people tools for career development and growth, and keeping diversity in mind when building products.